I am in my new home! Me and Toni and the kittens moved in a couple of days ago and we all love it! At the moment we are squashed into one roundhouse, but the second is now underway and hopefully it will only be a week or so before we that will be ready for habitation, and we can spread out a bit. We have been really busy these past two weeks. 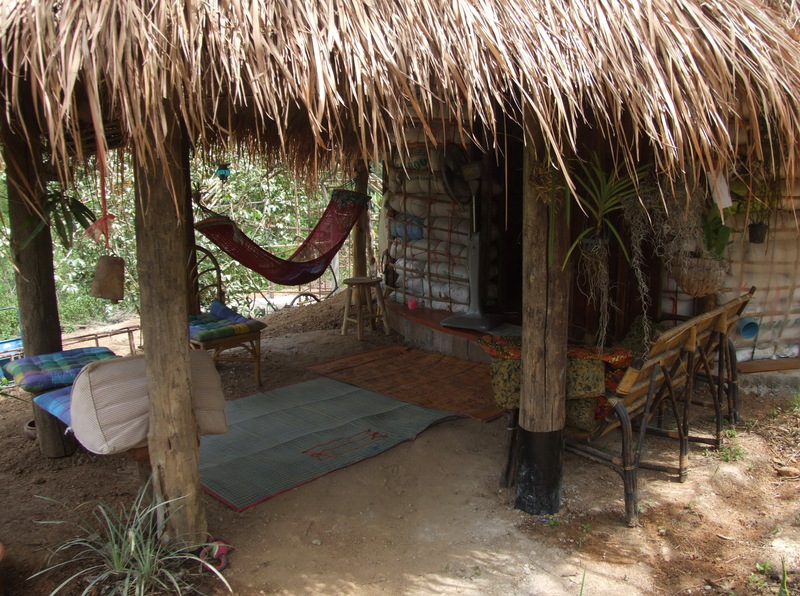 This is where I left off in the last blog – thatching. 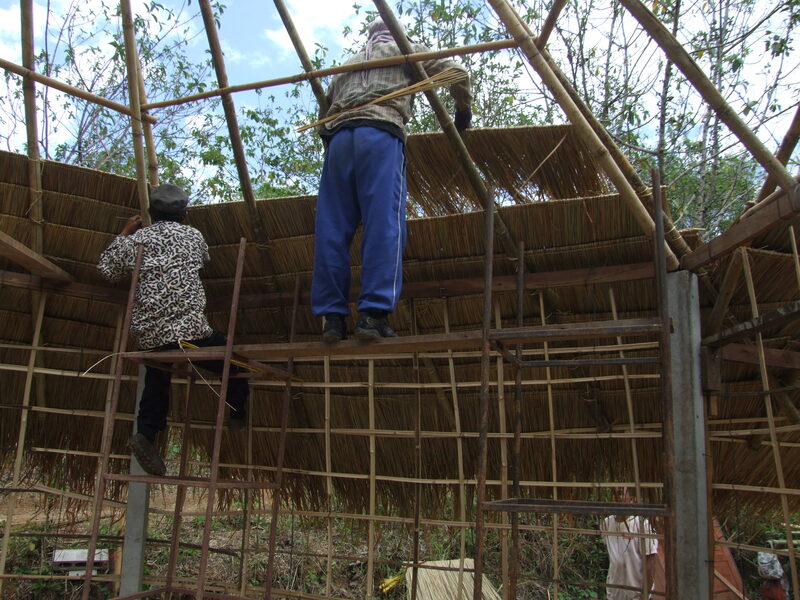 Attaching the thatch to the bamboo roof structure. A day later and this is where we were. 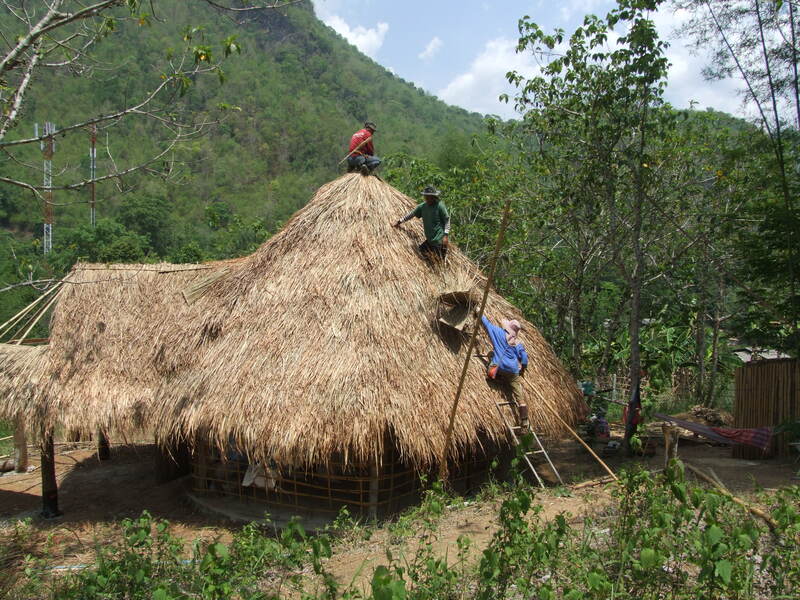 Forming a chain to get the thatch up to the top of the roof. And on goes the top-knot! 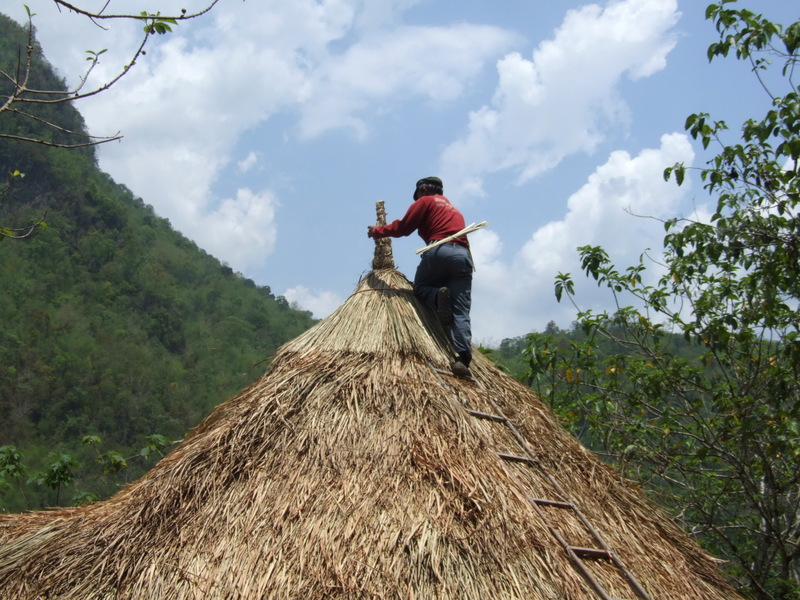 The final piece of roof – a top-knot. The roof it now complete! It is very beautiful inside and the new thatch smells wonderful. 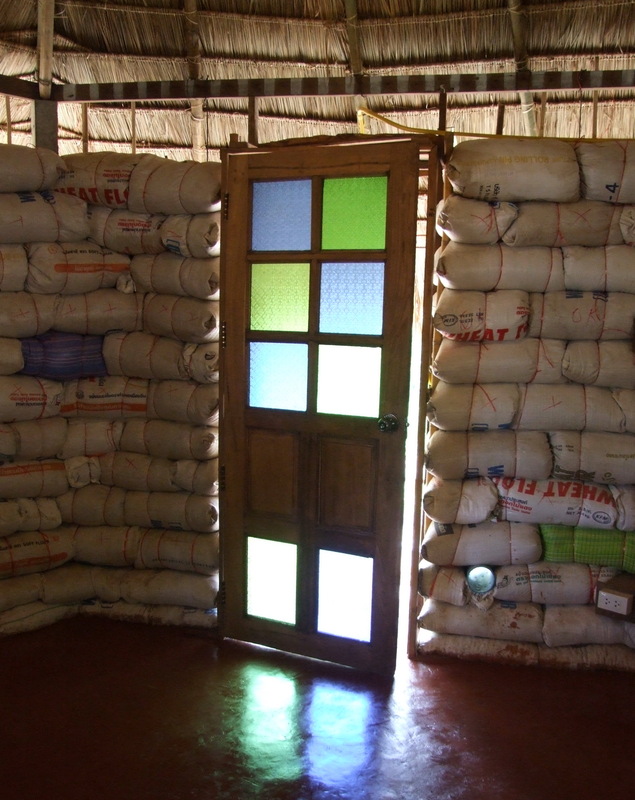 Inside we are preparing gravel bags for the first layer of the wall….. Preparing bags of gravel for the first layer of wall. 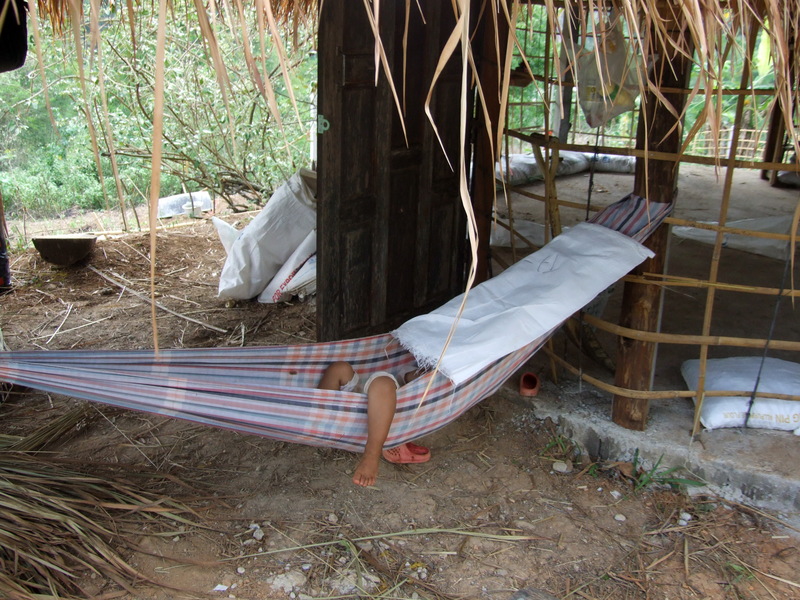 …while the littlest worker takes an afternoon nap. Littlest worker taking a nap. Do you remember my first blog when I was looking for a tractor to do some digging and couldn’t find one? Well, I was driving back to my rented house the other day when I saw a machine digging a ditch at the side of the road. Just what I needed! I stopped the truck and hailed the digger driver. He agreed to come and dig my swimming pool, and turned up last week and got the job done in just a couple of hours. It would have taken a week for half a dozen people to make the same hole. Digging my ‘natural’ swimming pool. As you can see it is not a huge swimming pool, but should be great for cooling off on hot afternoons. It’s going to be fun finding water plants to surround it. They will keep the water clean without having to use chemicals… theoretically. I am sure it will take a bit of experimentation as so far most natural swimming pools on the internet seem to be in temperate climates. I got the idea from David Pagan Butler who has made a great DVD on how to go about creating a natural swimming pool. Do you see that great pile of wonderful red earth on the side? 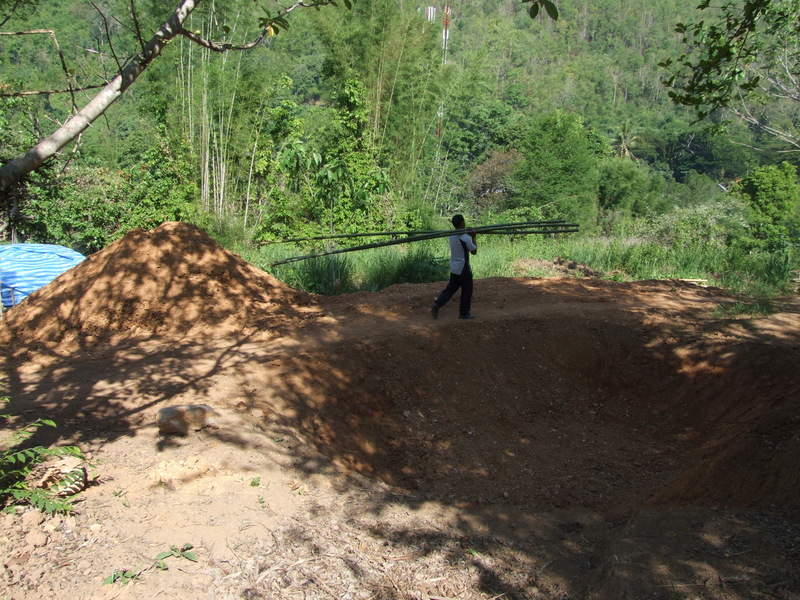 That is going to be used to build an earthbag dome, when Paulina Wojciechowska (earthhandsandhouses.org) comes to Chiang Dao in February 2014 to run a workshop! You heard it first here…. 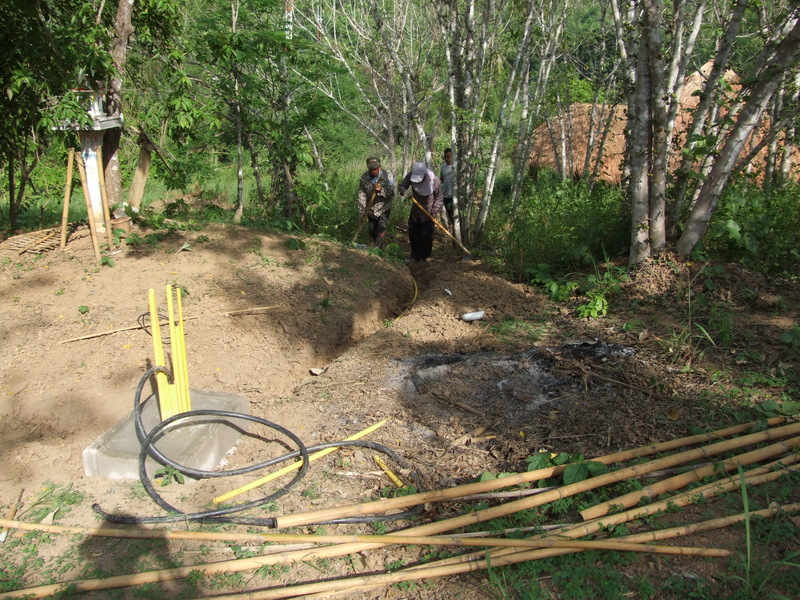 The electric cable goes into the earth. Meanwhile, the electrician has been hard at work connecting me up to the line which, luckily, runs down the road in front of the property. 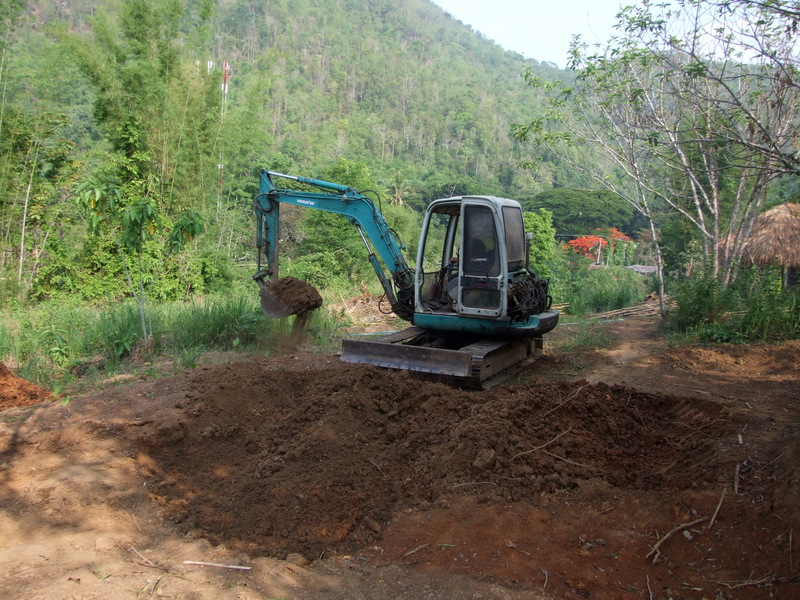 My workers are digging the ditch for the cables, which will all be underground so that our views will not be interrupted by strings of wires. 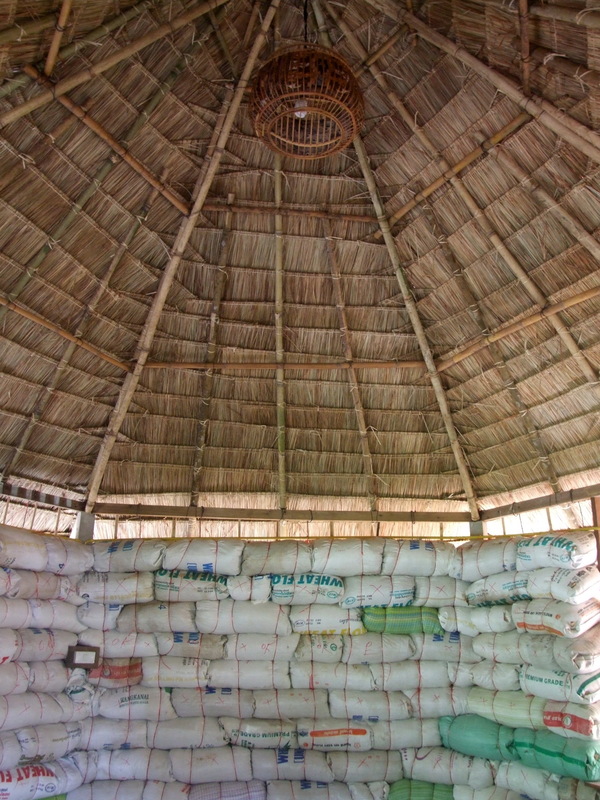 The bags of rice husks are complete, with a gap left at the top of them underneath the roof for the air to circulate through the roundhouse (perfect for kittens to play on). This house is actually more of a hexagonal than round house, which makes it a very interesting looking building. Note the ceiling light, an upside down birdcage lined with batik. 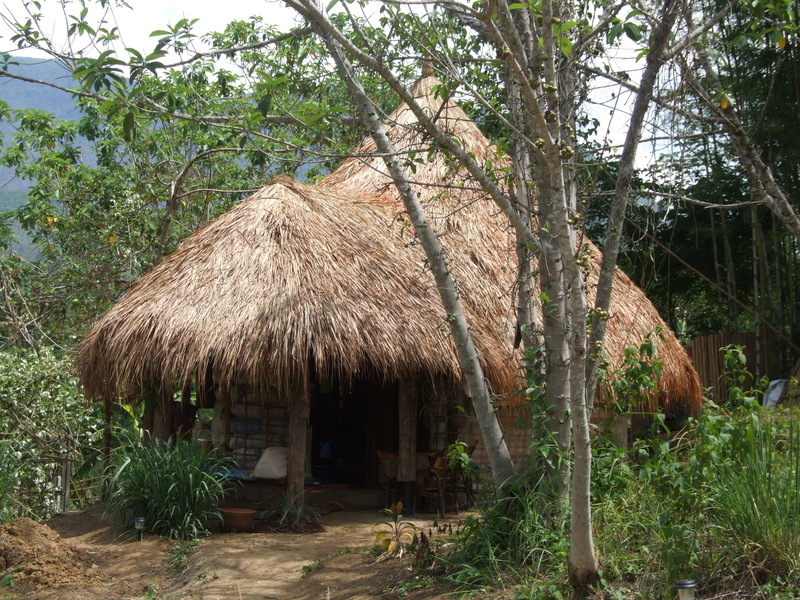 We are not going to cob the walls yet – I need to move in as soon as possible. I plan to drape bits of cloth over the bags until the time is right to finish off the building. Outside, the lower bags will have a piece of plastic tucked around them to protect against driving rain should we get any – the monsoon is terribly late this year! It’s turning out to be a good idea to have built my house now, as I am using it as a place to experiment. 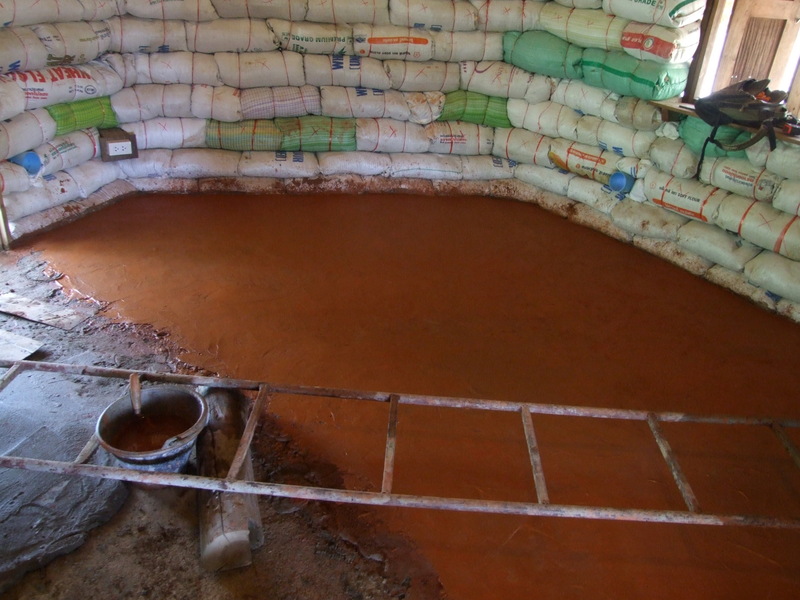 Look at the lovely terracotta coloured floor. Hard to believe it is concrete… This picture also captures the hexagonal shape of the walls. The light shines through the coloured glass and makes patterns on the polished floor. I found this old door in the second hand wood shop, leaning sadly against a fence outside, with only two of its original teak wood panels left. I had this coloured glass put in. It is modern glass but copied from the old style of Thai window glass. So here we are in our new home! Toni and the kittens look perfectly comfortable. Toni and the kittens at home in their new home. My hammock is up on the porch. Now I am really at home! My hammock on the porch. I am jelious of you being able to put your electric cables underground. The electric company here refused to let me do underground they were very ad amit that it could not be done. So for now I have relented..but may go off the grid in time. We got our kitchen in! It looks great and is a joy to work in…made popovers first morning and pizza that night….hope we can get a chance to come up and maybe see Paulina when she is there. Mike Wood (apprenticed with CalEarth) may be visiting at the same time…might have to take a road trip up your way. Congrats on getting your kitchen. I haven’t got mine yet and still outside for shower etc. Pizza sounds great – I haven’t had one for months! I did not ask the electric company – I just hired an electrician. At the moment I am joined up with a neighbour until I get the paperwork done to get my own meter. I think once the electricity is on your property you can do what you want – how will they know if you put the lines underground? I can give you my electrician’s phone number if you would like to chat to him about it (in Thai). I am sure he would be happy to give you advice. It would be great to see you and Mike when Paulina comes to visit. She spent time at CalEarth too. 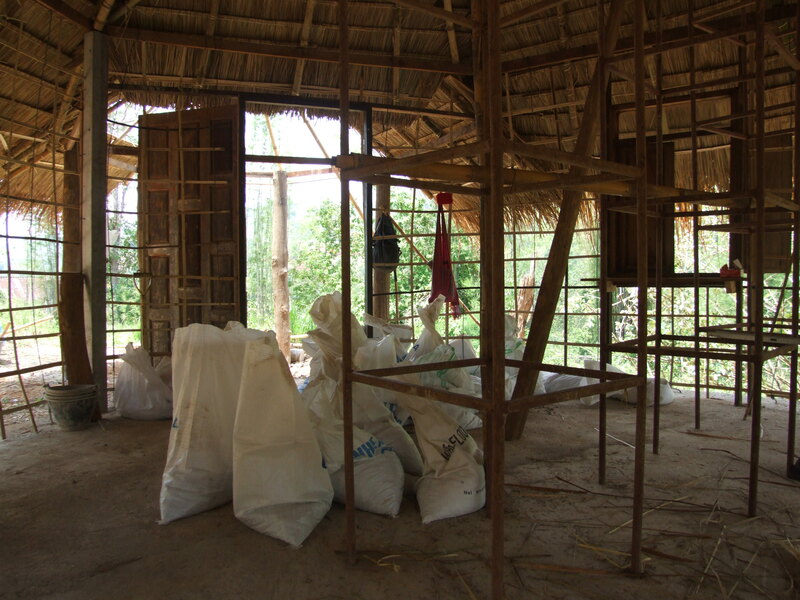 There are some other buildings with various types of mud and rice husks around here. Maybe we should think about a tour of them all – could be fun and I think others would like it too. I am sure Paulina would. Hey Maggi! Looks wonderful!! Great job and I bet you are so happy to be living in one of your domes (bird cages??) Yes cobbing/rendering walls can wait, enjoy your space for now. Love your pics. 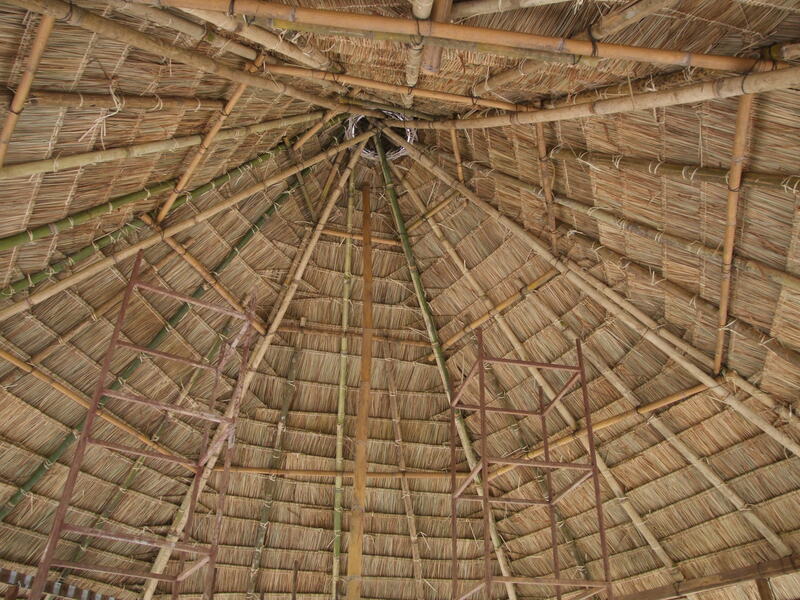 Oh, does the bamboo you use for building need to be ‘treated’ before use for longevity? Like in Australia, because of borer and such, it is advisable to treat immediately – when cut sit in copper sulphate solution, which is drawn up the bamboo. Just wondering. I have earthworks on my block tomorrow!! And, one more thing… I used to live at Crystal Waters Eco Village (still only half hour down the road from where I am now – I’m just ‘in town’) and was visiting a friend for a shared meal on Sunday night, she had 3 wwoofer staying with her that are heading over to Thailand soon (2 English, one Geman) and want to meet up with natural builders and people interested/living alternate ways. 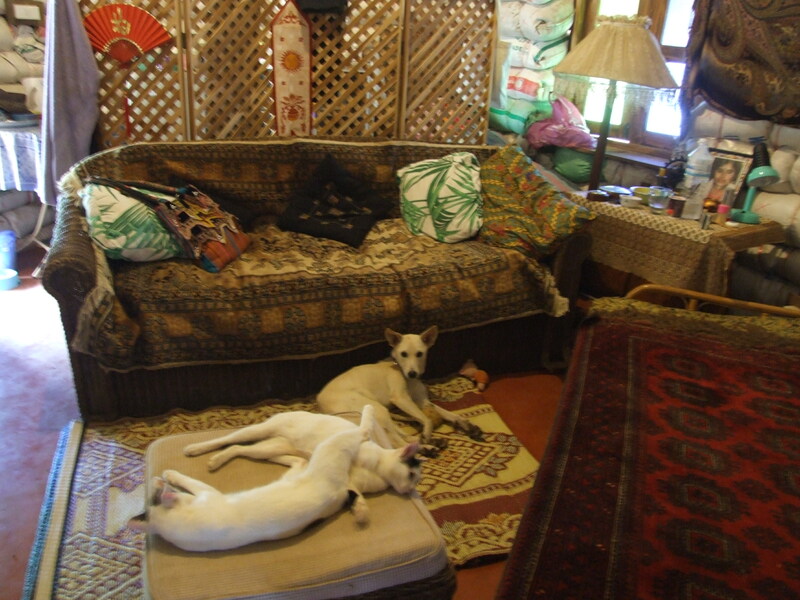 You came to mind, I mentioned you and what you are doing, they wondered if you have wwoofers stay?? 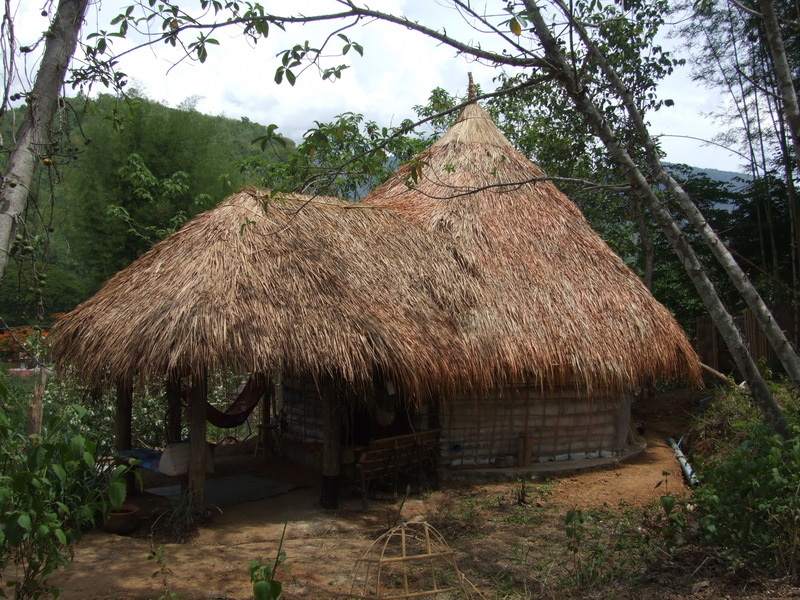 They also thought there was a permaculture school in Northern Thailand. I thought I could pass on your blog address?